2. Chan YH, Siu CW, Yiu KH, Li SW, Lau KK, Lam TH, Lau CP, Tse HF. Abnormal Vascular Function in PR Interval Prolongation. ClinCardiol. 2011 Oct;34(10):628-32. doi: 10.1002/clc.20958. 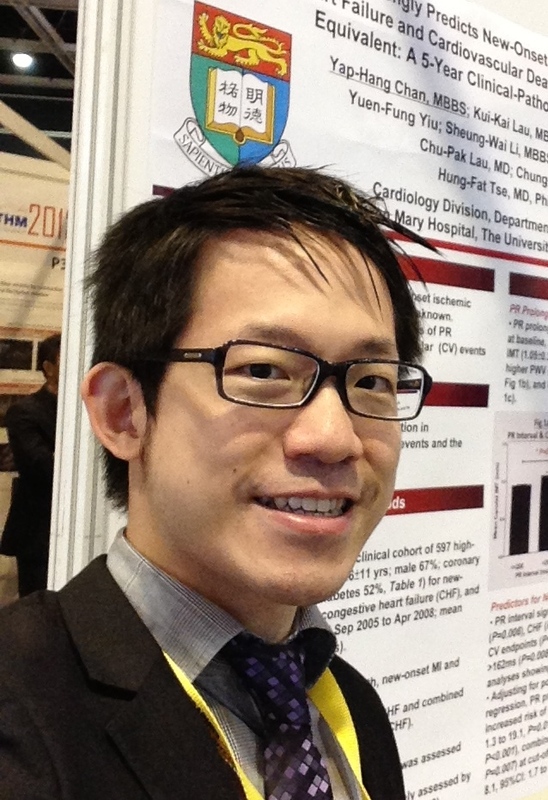 3.Chan YH, Siu CW, Yiu KH, Yiu YF, Lau KK, Lam TH, Lau CP, Tse HF.Prolongation of PR interval is associated with endothelial dysfunction and activation of vascular repair in high-risk cardiovascular patients.J Interv Card Electrophysiol. 2013 Jun;37(1):55-61. doi: 10.1007/s10840-012-9777-z. Epub 2013 Feb 7. 5. Chan YH, Lam TH, Lau KK, Yiu KH, Siu CW, Li SW, Chan HT, Tam S, Lau CP, Tse HF. Dietary Intake of Phytoestrogen is Associated with Increased Circulating Endothelial Progenitor Cells in Patientswith Cardiovascular Disease. Eur J CardiovascPrevRehabil2011 Jun;18(3):360-8. Epub 2011 Feb 14. 6. Chan YH, Siu CW, Yiu KH, Chan HT, Li SW, Tam S, Cheung BM, Lau CP, Lam TH, Tse HF. Adverse Arterial Function in Patients with Selenium Deficiency. J Nutr Health Aging 2012 Jan;16(1):85-8. 7. Chan YH, Lau KK, Yiu KH, Li SW, Chan HT, Tang S, Shu XO, Lau CP, Tse HF. Isoflavone intake in high risk patients for cardiovascular events: implications on vascular endothelial function andcarotid atherosclerotic burden. Am J ClinNutr 2007 Oct;86(4):938-45. 8. Chan YH, Lam TH, Lau KK, Yiu KH, Siu CW, Li SW, Chan HT, Tam S, Lau CP, Tse HF. Prospective Observational Study of Isoflavone and the Risk of Stroke Recurrence: Potential Clinical Implications Beyond Vascular Function. JNutr Health Aging 2012 Apr;16(4):383-8. 10.Yiu YF, Chan YH, Yiu KH, Siu CW, Li SW, Wong LY, Lee SW, Tam S, Wong EW, Cheung BM, Tse HF. Vitamin D Deficiency Is Associated with Depletion of Circulating Endothelial Progenitor Cells and Endothelial Dysfunction in Patients with Type 2 Diabetes. J ClinEndocrinolMetab2011 May;96(5):E830-5. Epub 2011 Feb 16.